Every owner wants to do the best for their cat, and vets try their hardest to keep costs reasonable, but there is no denying that accidents or long-term illnesses can cause the veterinary bills to mount up. 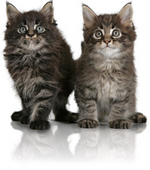 Insurance offers peace of mind that you will be able to provide the care your kitten needs, should a crisis happen. Pet insurers offer different levels of cover, and prices vary according to your kitten’s age, breed or size and type, as well as your location. Costs start at around £7 per month. The easiest way to find the right cover for you and your kitten is to use the internet to check out what’s on offer and find the right package for you. Other sources of information are your vet’s waiting room and pet magazines.